5 feet or anywhere in between. 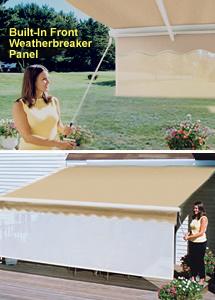 This discreet Weatherbreaker, blocks out up to 90% of sun and wind, but lets in air and light. The Weatherbreaker operates with a simple hand crank (included). 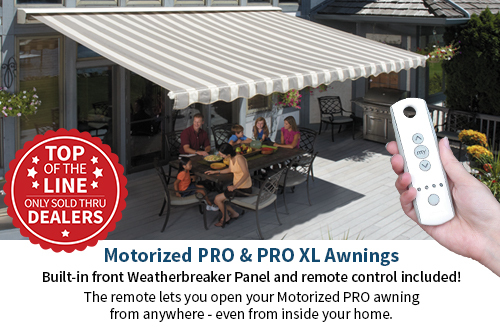 If you want the ultimate in shade, protection, ease of use, and included features, plus your choice of beautiful woven acrylic fabric, the SunSetter Motorized PRO or PRO XL is the model to choose. • Up to 10 ft. 2 in. projection. • Woven acrylic fabric available on 8 to 20 ft. widths. • 11 ft. 8 in. projection. • Widths from 14 to 20 ft.
• Woven acrylic fabric only. • Minimum height needed under overhangs for installation: 7 ft. 6 in. • Use optional Roof Brackets when minimum height is not available. • Both the PRO and PRO XL have a standard 18 ft. plug-in cord, optional 24 ft. cord available. • We strongly recommend a ground fault interrupter-style outdoor outlet.